Watch his drawings as he grows from a young, talented artist, to a true Disney animator. Follow him as he goes around the world and sketches flamenco dancers, football players, bakers, joggers, lions, tigers, anyone, and anything. 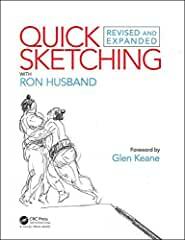 - Get tips on quick sketching from a Disney legend who has animated or supervised some of your favourite recent Disney movies like The Fox and the Hound, The Little Mermaid, and Beauty and the Beast. - Features artist’s guide and handbook which provides instruction while chronicling the author’s growth as an artist. - Quickly try out Husband’s instructions and tips as you learn them in a sketchbook at the back of the book. - This new edition re-emphasizes the four basic shapes and how important it is to recognize them in fast action. - Stressing the importance of observation and the vital part this discipline plays in sketching.